"Your Mother Should Know," a McCartney composition, was recorded at Chappell Recording Studios in London on August 22 and 23, 1967. A different (and quite informal) version is featured on Anthology. The song was included on the Magical Mystery Tour LP and performed in the film of the same name in the finale, when the Beatles descend a staircase, all four wearing white tuxedos. The Beatles fact here is that Paul wore a black caranation because they ran out of white ones, but this would later become another "clue" in the "Paul is dead" rumors. McCartney sang lead vocal, with Lennon and Harrison providing backing vocals. 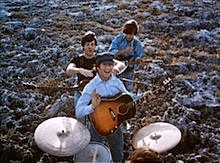 McCartney plays bass and piano, Lennon organ, Harrison tambourine, and Starr drums.